Region: This borer can be found as west as Texas, but is primarily found in eastern portions of the United States. Life cycle: The life cycle of this insect requires two to four year to fully complete. The larva does the hibernating in its feeding position, while the pupation occurs in the spring. The adult beetle emerges in early to mid summer. Physical Description: The 1 1/2 inch long grub is brownish white with a brown head and a rounded thick area behind its head. The adult is slender, long-horned beetle, colored grayish brown and marked with two conspicuous longitudinal white stripes, a white head and is one inch in length. The eggs are laid in curved slits in the bark. Feeding characteristics: This pest attacks the apple, peach, plum and quince trees. 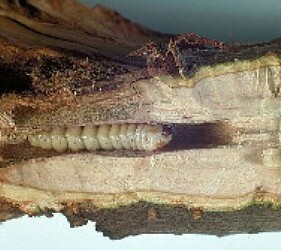 The Borers start by feeding on bark, causing a dark brown stain during the first year. The next one to two seasons, the insect enter the inner bark, pushing out a brown frass. The next and last year, the borer mines the heartwood. Infestations can weaken or girdle a tree and young trees may be killed. Controls: Locate the borer by finding brown castings just above or below ground level. Destroy the insect by snaking a wire into their holes. Perform this each fall and spring. You can also kill the insect by pouring boiling water into the entrance of the holes. To discourage the pest, put a thick wash of soap on the lower trunk. This will keep them from laying their eggs there.